It's the accident season, the same time every year. Bones break, skin tears, bruises bloom. I received a proof of this at the beginning of May, but sadly didn't get a chance to read it before I went to an event in London and got to meet the author. I really wish I had, although it's probably better that I hadn't or I'd have monopolised her for hours until she was dying for an opportunity to escape! In the end it was a book that led to me staying up to finish it, and then having to leave the landing light on. There are so many reasons that I loved this story that it's difficult to know where to start to describe it, especially without accidentally spoiling any of the twists and turns; but I'll do my best. I loved Cara's family; her big sister Alice, her not-really-a-brother Sam, and her mum, Melanie. I especially liked that fact that Melanie was referred to by her name, as it stopped her being just a flat "mum" character and made her someone else to worry about. I loved Cara's brave friend Bea; her tarot card obsession, her willingness to just accept what was going on and to roll with it, and her eventual romance at the end. 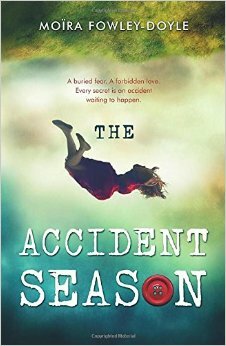 I thoroughly enjoyed reading The Accident Season, and I'm very much looking forward to Moïra's next book. Kate has read 10 books toward her goal of 104 books.